Developed by Elecard, the bitstream analyzer comes in trial and full versions. The analyzer currently runs on Windows machines with Microsoft .NET framework installed. To install, download the installer from  and follow the on-screen instructions. The User manual  explains the system requirements. Once installed successfully, start by opening a HEVC file and explore the various features available using the menu bar in the main window. Figure 1 shows the main window, which includes the frame navigation view, picture view, metadata information, bitstream view and coding unit information view. Frame navigation includes a frame size chart with colours highlighting different types of frames (I, P and B), area chart with coding stats per frame and thumbnails. Header information at all levels of the video stream can be viewed in the metadata panel. Picture overlay options include block partitions which appear as a grid over the current picture, a colour-coded grid for different prediction types, motion vector field, block sizes, quantizers and residual. The bitstream panel includes a hex viewer and displays a hierarchical view of the syntax elements in the bitstream.  The coding unit panel displays location, slice index, tile index, sizes, coded, prediction (mv, mvd and mv candidates) and transform unit information. Developed by Parabola Research, the analyser is available in trial and full versions from their website . The software currently runs on Windows machines only. To install, register with Parabola Research  and a download link to the software installer is sent via email. Run the installer and follow the on-screen instructions to install the software. The user manual is available at . Figure 6 shows the main window which includes the frame navigation view, picture view, bitstream pane and coding statistics pane. Frame navigation using thumbnails, inter-picture dependency graph or bit distribution chart. The inter-picture dependency graph has colours highlighting different types of frames (I, P and B) and arrows indicating frame relationships. Picture overlay options include block partitions, colour-coded prediction types, motion vector information and compression details such as bits per block, qp and residual. 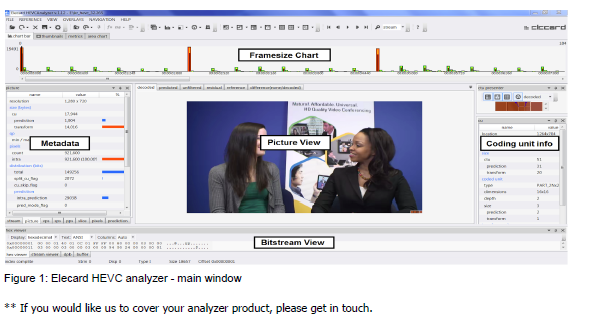 The bitstream viewer is consistent with the HEVC specification and allows the user to analyse the bitstream at picture, slice and block levels. Visualisation of video bitstream characteristics from picture relationships to CABAC bins. The software also includes error reports, error descriptions and references to the standard. Developed by Solveig Multimedia, the software is available from  and comes in demo and full versions. The demo version allows analysis of first 10 frames per sequence with no time limit. Registration is required to get the download link for the demo version. The documentation and FAQs are available at . Figure 11 shows the main window, which includes picture view, toolbar options, bitstream pane, and the timeline window. The timeline window shows bits per frame and video quality measurement using PSNR and MSSIM metrics. Picture overlay options include picture type, colour components, slice/tile boundaries, partition types, transform partitions, motion vectors and compression details (bits, residual and qp). Bitstream pane has options to display bitstream syntax, stream stats, frame stats and information at frame and coding unit level. There is an option to observe buffer size statistics including a buffer fullness plot. Includes a command line tool for generating quality reports. Linux 32 and 64 bits versions of Zond 265 are available. Abharana Bhat specialises in video compression, media streaming and video quality assessment. Her PhD thesis on quality assessment of compressed video included the development of a novel, fully automated video quality metric.